This is a quick, simple yet tasty and chocolateee burfi loved by all. Broken cashews - 100 gm. Break cashews into small pieces. The cashews in each bite gives an excellent taste to the chocolateee burfi. So be generous in cashews. Heat a heavy-bottomed pan, pour in the milkmaid, butter, sugar, cocoa powder and cashews. Mix well. Ensure medium heat and stir continuously till the mixture leaves the sides. Transfer to a greased plate and when warm, cut into desired shapes. congrats n I am glad to be part of your celebrations with choco barfi..all the best!! Congrats Shanthiji. 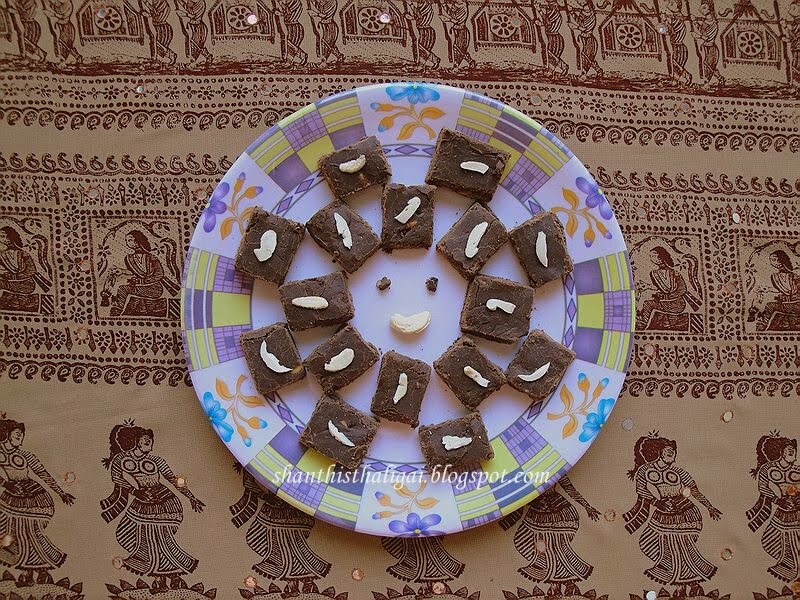 Love this barfi.I can imagine the chocolatey taste interspiced with cashews-yummy yum! hey congrats dear.. 10 lakhs is such a huge number.. congrats again for reaching this big milestone :) nice visual treat..
Congrats on another milestone! Wish you many more ahead..
love chocolate and nuts.. this looks awesome! Congrats on ur milestone and this burfi is sure a hit. Hi Shanthi Congrats,burfi looks yummy' delicious. Congrats Shanthi aunty!!! wishing many more milestones to celebrate!!! and this burfi looks soooo good!! Way to go Shanthi, joining in your celebration, burfi looks superb..
Congrats Akka, wishing you many more milestones like this. Burfi looks super attractive. Hearty congrats! !Very apt celebration dish!! That is very wonderful. Many congratulations on the mark of occasion. Bookmarked the easy recipe will try it soon. Many Many Congrats and wishes for a few more 10 lakh hits. You know how much I love this space. Thanks for all your hard work in maintaining this Maami!